Terminator Salvation is a 2009 American military science fiction action film directed by McG and written by John Brancato and Michael Ferris. The film stars Christian Bale and Sam Worthington, with Anton Yelchin, Moon Bloodgood, Bryce Dallas Howard, Common, Michael Ironside, and Helena Bonham Carter in supporting roles. 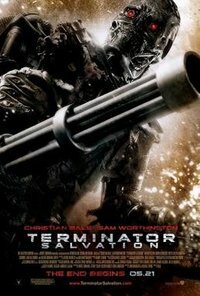 It is the fourth installment of the Terminator film series. In a departure from the previous installments, which were set between 1984 and 2004 and used time travel as a key plot element, Salvation is a post-apocalyptic film set in the year 2018, fourteen years after the events of Terminator 3: Rise of the Machines. It focuses on the war between Skynet's machine network and humanity, as the remnants of the world's military have united to form the Resistance to fight against Skynet's killing machines. Bale portrays John Connor, Resistance fighter and central character to the franchise, while Worthington portrays cyborg Marcus Wright. Yelchin plays a young Kyle Reese, a character first introduced in The Terminator, and the film depicts the origins of the T-800 (Model 101) Terminator. After a troubled pre-production, with The Halcyon Company acquiring the rights for the franchise from Andrew G. Vajna and Mario Kassar and several writers working on the screenplay, filming began in May 2008 in New Mexico and ran for 77 days. Terminator Salvation was released on May 21, 2009, in the United States and Canada, followed by early June releases in the United Kingdom, Australia, New Zealand, and South Africa. Warner Bros. handled the North American release while Columbia Pictures handled the international release. The film grossed over $371 million worldwide and received mixed reviews. A reboot of the film franchise occurred with the release of Terminator Genisys in 2015. This webpage uses material from the Wikipedia article "Terminator_Salvation" and is licensed under the GNU Free Documentation License. Reality TV World is not responsible for any errors or omissions the Wikipedia article may contain.